My name is Lord-Pharaoh ImHotep-AmonRa, CEO, founder and manufacturer of the Egyptian Magic All-Purpose Skin Cream "The People's Choice," and I AM HUMBLED AND HONORED TO BE OF SERVICE TO YOU. Egyptian Magic All-Purpose Skin Cream "The People's Choice" is new to your market. It is a phenomenal healing balm with legendary powers due to its unique mixture of all natural ingredients derived only from living plants and organisms. Egyptian Magic All-Purpose Skin Cream "The People's Choice" has been on the market since August 1991 with a solid track record, a loyal word of mouth following, and twice the healing power for half the price of conventional skin creams. Let me relate a short story to you. In 1992, a screenwriter with residences in Beverly Hills, CA. and Santa Fe, New Mexico purchased a jar of Egyptian Magic All-Purpose Skin Cream " When she returned home to California, she contacted a friend who owns the SANTA MONICA HOMEOPATHIC PHARMACY and they became a client after hearing about Egyptian Magic All-Purpose Skin Cream "The People's Choice" by word of mouth. Egyptian Magic All-Purpose Skin Cream "The People's Choice" is made with the blessings and guidance of our ancestors and with the following pure ingredients: olive oil, bees wax, honey, bee pollen, royal jelly, bee propolis and Divine love. 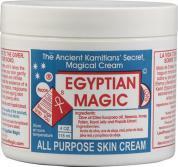 Egyptian Magic All-Purpose Skin Cream. Surveys show that about 35% of the clients using Egyptian Magic All-Purpose Skin Cream "The People's Choice" had eczema and psoriasis. When they found that conventional skin creams could not solve their problems, these clients turned to natural health food stores and to their delight discovered Egyptian Magic All-Purpose Skin Cream "The People's Choice." Egyptian Magic All-Purpose Skin Cream "The People's Choice" is today's all-purpose skin cream of choice, recommended and used because of its all-natural pure super healing ingredients and its phenomenal results. Even pharmaceutical companies secretly acknowledged that products derived from all pure natural living sources are better than those products derived from chemicals. Today, scientists in the Amazon are finding the most powerful solutions from the rain forest.